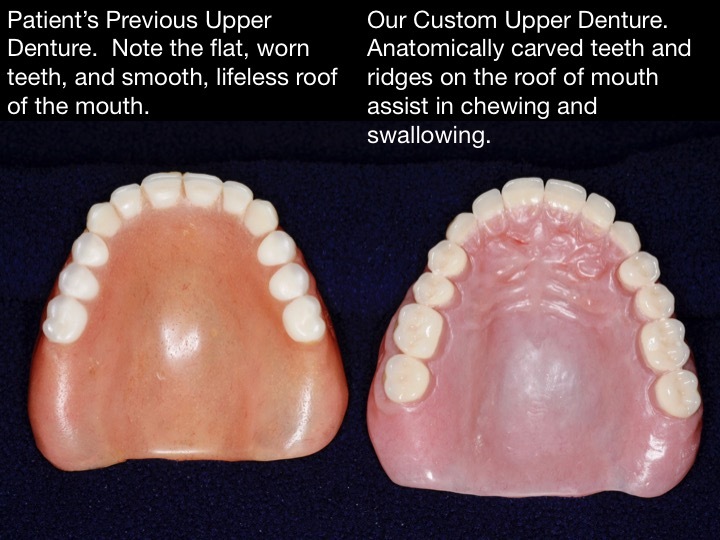 I have spent my professional life trying to help people from ever losing their natural teeth, if possible, in maximum comfort, function and natural beauty. 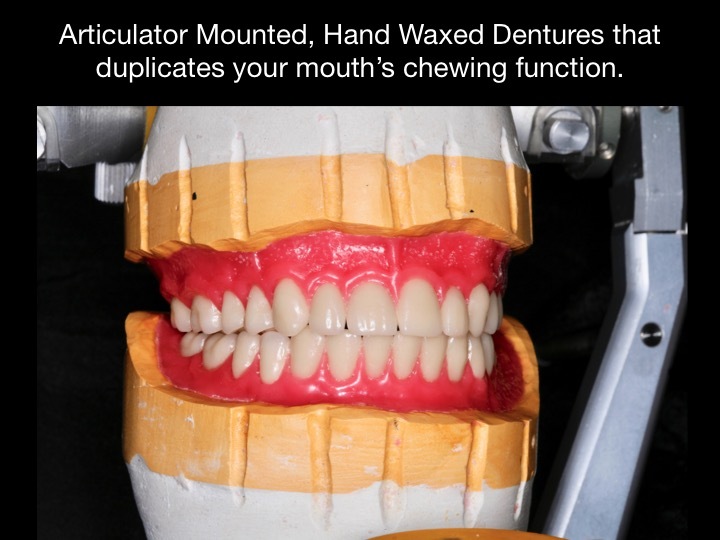 However, if they lose their teeth, I believe that their dentures should be constructed with attention to detail and with as much precision as possible. 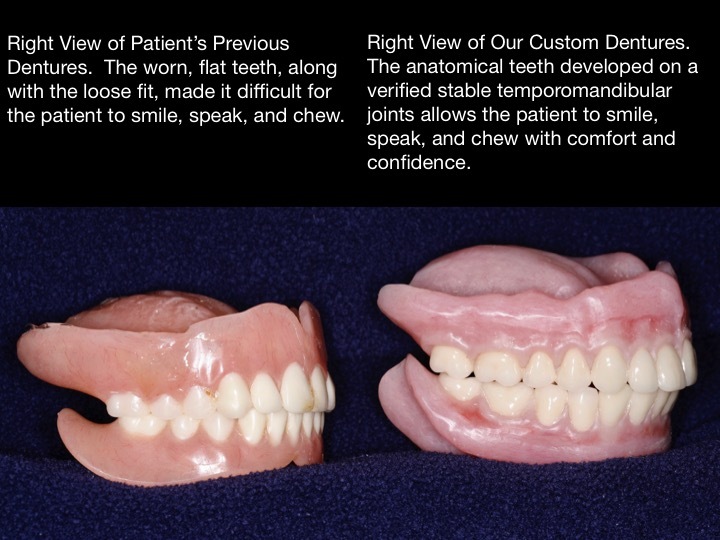 Allowing my patients to speak, smile, and dine with confidence in maximum comfort and function. 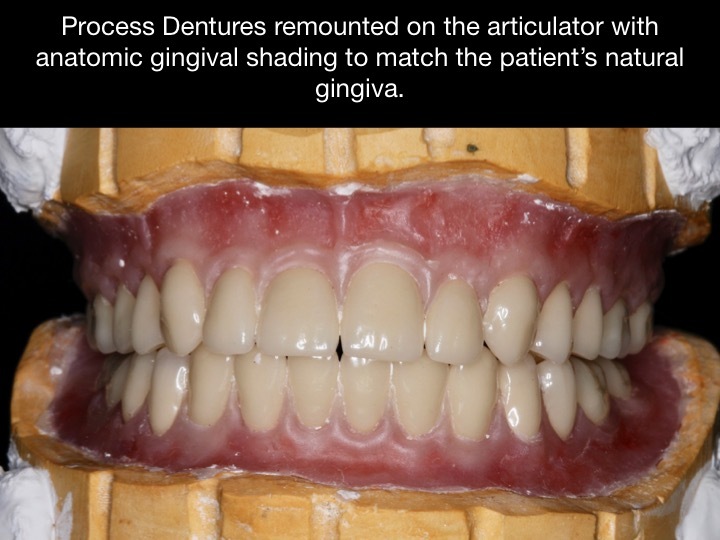 Then we may be able to help you using the Provisional Training Denture Technique. 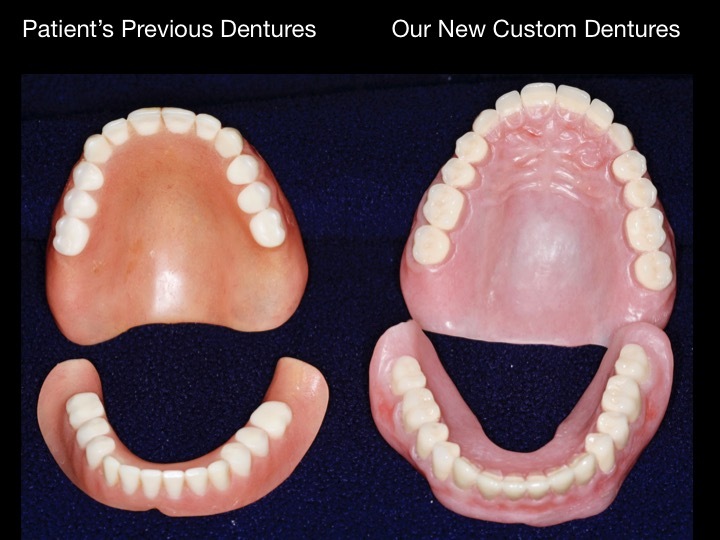 The Traditional Approach to Making Dentures: It makes no difference where or when a dentist went to dental school, they were taught to make preliminary impressions, pour the casts and construct custom impression trays. The final impressions are completed after careful border molding. Next, base and rims are constructed and the midline is marked at chair side and a bite is registered (and not necessarily in harmony with your stable jaw joint position). The new casts are placed on a dental articular and the teeth are set. 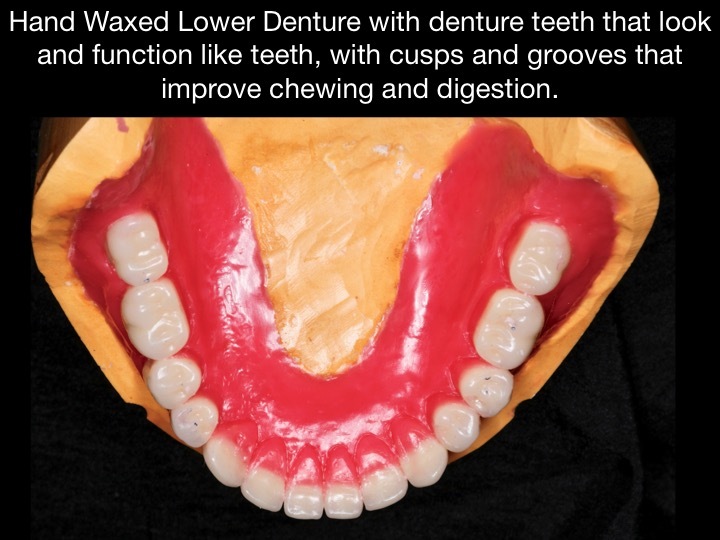 Then the patient returns for the wax try in and, if approved by the patient, their dentures are processed and delivered. Most times, this is when the trouble really begins with multiple adjustments and frustration of the patient. 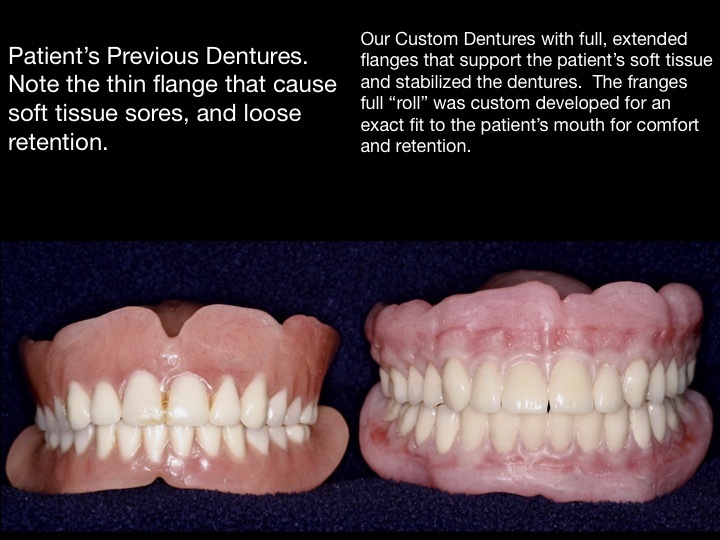 Or worse, the denture fabrication process has been streamlined to one set of impressions and same-day delivery of dentures that never feel right, or fit properly. The left and right temporomandibular joints (jaw joints) are verified to be in a stable condylar position. The condyle is the head of your lower jaw joints that fit and function at the base of your skull. 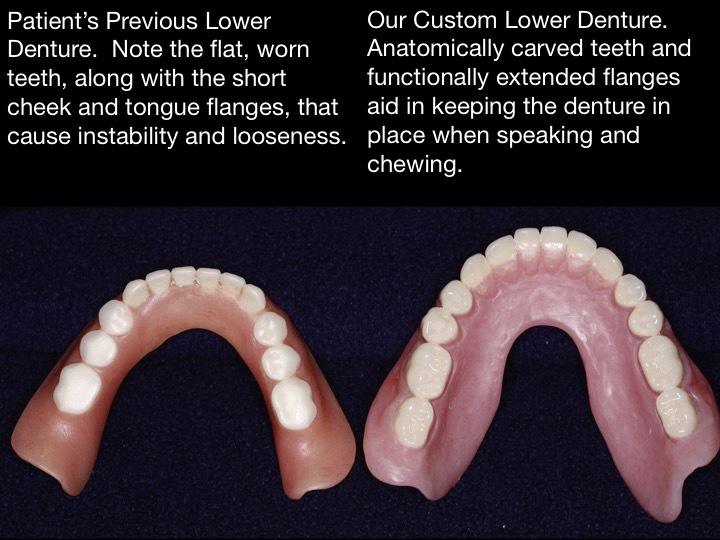 Like a three-legged table, the left and right condyles form two of the legs and your dentures form the third leg. 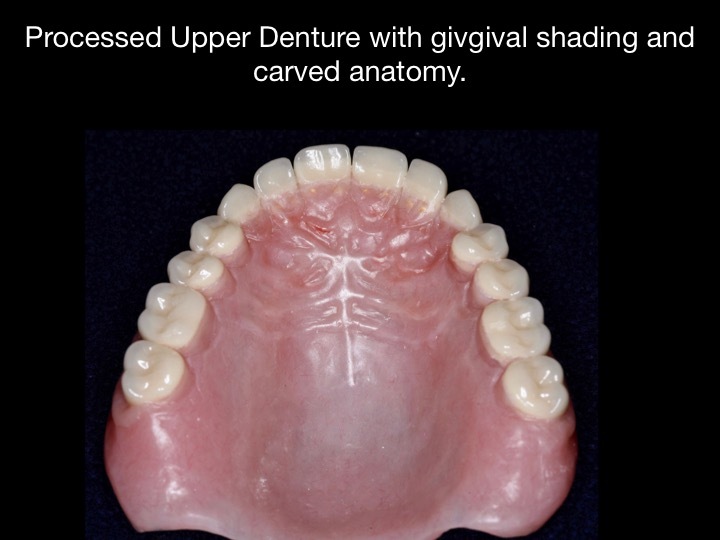 If both of these joints are not seated, your denture will never fit properly. 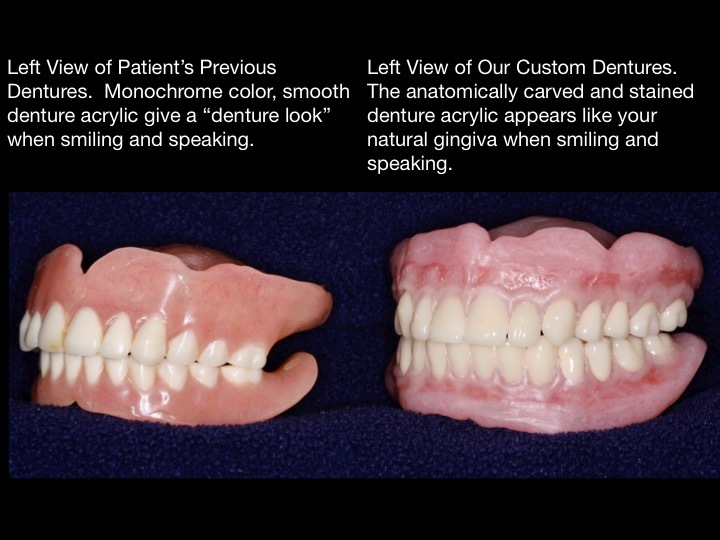 Speech and esthetics are utilized to position the anterior teeth and reestablish your missing anterior teeth from your toothless condition. 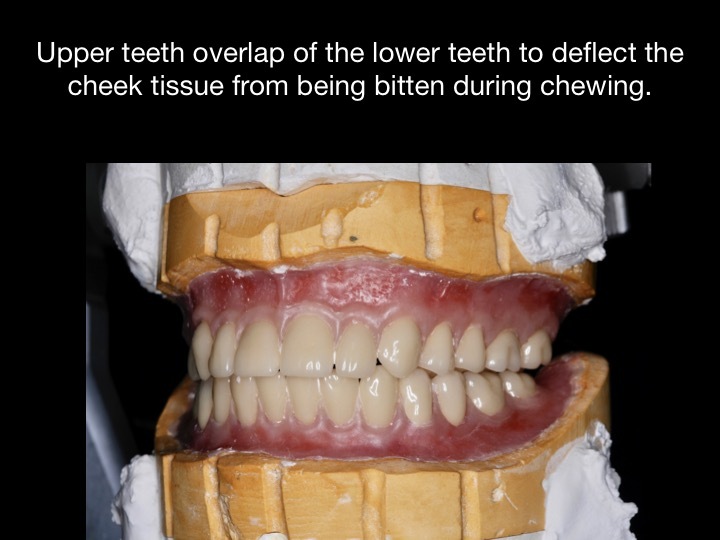 A lingualized posterior occlusion that allows balanced posterior bite when you chew and swallow. 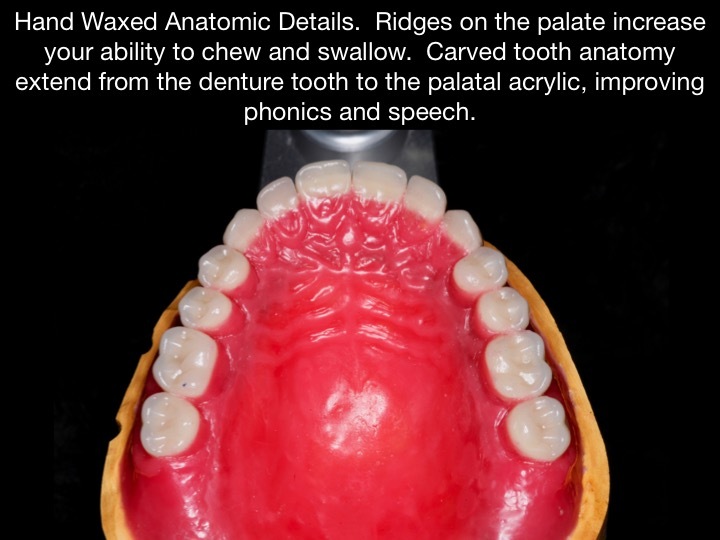 Utilizes upper posterior teeth with short non-interfering cheek cusps that deflects the cheek tissue (so you don’t bite your cheeks) and sharp palatal cusps that allow chewing in shallow, open landing zones of lower posterior teeth. 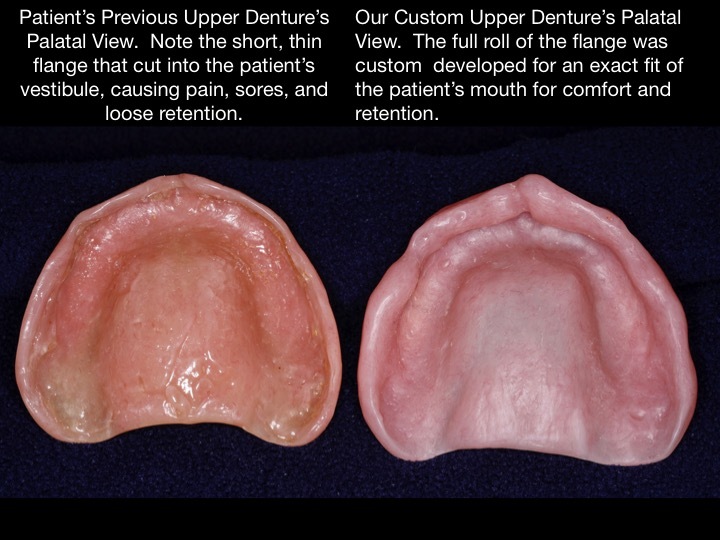 Provisional (training) dentures are utilized to test the proposed fit, speech, chewing, swallowing, comfort, and esthetics, while treating any inflamed toothless tissues. 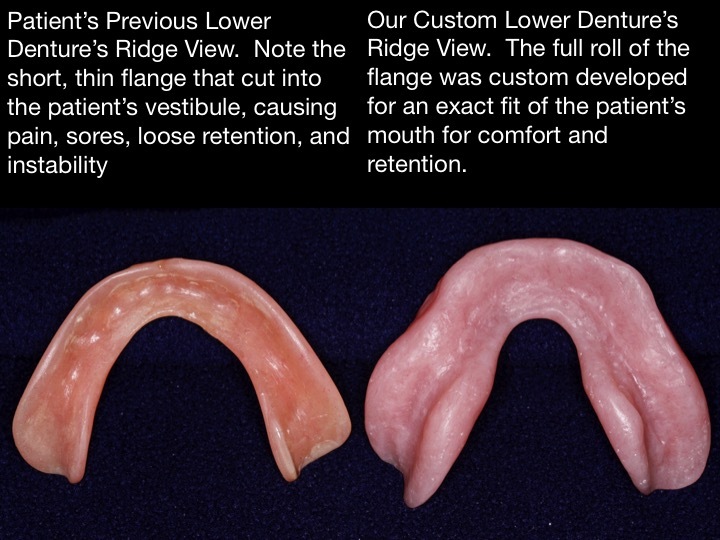 They allow exquisite functional impressions to be made of the hard and soft tissues of your mouth. They also refine your ability to speak, smile, and chew. 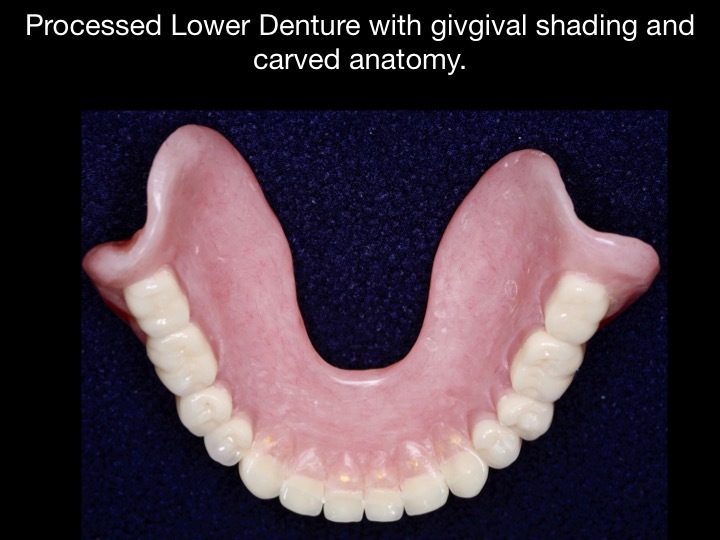 These four basic differences address the fundamental shortcomings present in "Traditional Denture Technique", and the "One Day Denture Technique". If the occlusion is not managed properly, you will be a dental cripple in the lower arch due to loss of bone.